An integral part of any diet includes protein, which can come from animal- or plant-based sources. Not only does protein make up a large percentage of your body's tissues, but you also need to consume protein in order to repair the cells of these tissues as they become damaged over time, states the National Institute of Health. For some people, eating protein may be difficult due to dental or other oral problems. Luckily, protein can be found in many different types of food, including those which are soft and easy to chew. Many types of beans are soft to eat, as well as protein rich. For example, black beans, navy beans, chickpeas, lentils and kidney beans all have seven to nine grams of protein per half cup serving. Beans can also be mashed into other products, such as hummus or bean dips for an even softer texture for meals and snacks. Tofu is another high-in-protein food that is also soft to eat. Tofu is created by curdling soy milk, which is made from soy beans, or edamame. The curds are then combined and packed into tofu cubes. Half a cup of tofu provides 10 grams of protein. Soy milk and cooked edamame can also provide an easy-to-eat form of protein. Cottage cheese provides one of the largest levels of protein per serving and is soft to eat. Coagulated milk creates milk curds, or cottage cheese. These milk curds are then harvested and washed to reduce their acidity. 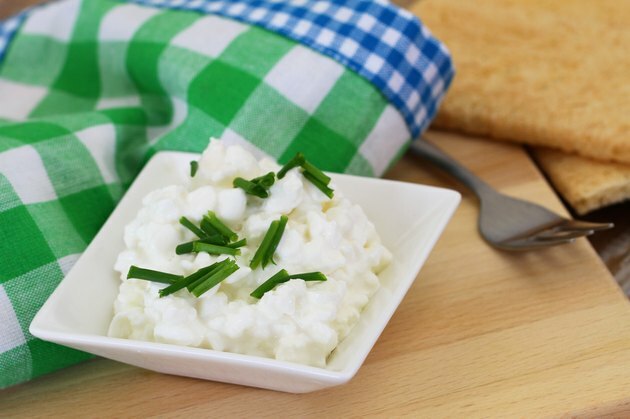 A half of a cup of cottage cheese can provide between 14 and 16 grams of protein. Yogurt, another healthy dairy product that doubles as an easy-to-eat protein, is made by fermenting milk with bacteria, such as Streptococcus thermophilus. The resulting product is a thick, creamy mixture that can be served with fruit or other flavorings. A single cup of yogurt can add up to 13 grams of protein to your diet. Most fish provides a soft form of protein, especially when cooked. Fish can vary in how much protein they deliver. For example, a 3.5 oz. can of sardines provides as much as 22 grams of protein. Popular fish such as salmon provides 16.9 grams of protein per three ounce serving, while tuna provides 16 grams of protein per quarter cup.